Charles Gati for New Book "Failed Illusions"
"Failed Illusions casts incisively a new perspective on three key dimensions of the historic drama that was the Hungarian Revolution: the unsavory background and the heroic epiphany of Imre Nagy, the revolution’s tragic leader; the confused, disruptive, and ultimately devious Soviet efforts to manipulate the Hungarian communists; and the impotent futility of US posturing which masqueraded as 'the policy of liberation.' Riveting as a story, significant as a history." "This important work deepens our knowledge of events through scores of new documentary findings, filling in fascinating details about events, decisions, and key players' personal philosophies and points of view. It's the only book of its kind." "Gati draws on reams of new research and documentary evidence from Hungary, while ferreting out scores of fascinating documents from the U.S. archives. Specialists on this subject will benefit immensely from this work, but the book is written in such an engaging manner that it will also appeal to a more general audience." "Come Clean in Hungary: Behind the 1956 Revolt"
Washington D.C., October 31, 2006 - Fifty years ago today the Soviet Presidium overturned its earlier decision to pull its troops out of Hungary in the face of a popular uprising, yet the CIA--with only one Hungarian-speaking officer stationed in Budapest at the time--failed to foresee either the uprising or the Soviet invasion to come, according to declassified CIA histories posted on the Web by the National Security Archive at George Washington University (www.nsarchive.org). Describing the several days in early November 1956 when it seemed the Hungarian Revolution had succeeded (before the Soviet tanks rolled in on November 4), a CIA Clandestine Service History written in 1958 commented: "This breath-taking and undreamed-of state of affairs not only caught many Hungarians off-guard, it also caught us off-guard, for which we can hardly be blamed since we had no inside information, little outside information, and could not read the Russians' minds." 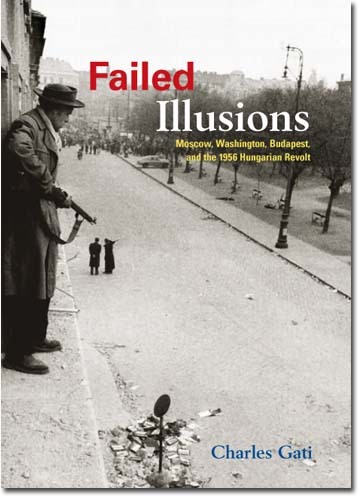 Through a Freedom of Information Act request and appeal, Johns Hopkins University (SAIS) professor Charles Gati obtained the heavily-censored extracts from two previously secret CIA histories in the Clandestine Service History series for his critically-praised new book Failed Illusions: Moscow, Washington, Budapest and the 1956 Hungarian Revolt (Stanford University Press and Woodrow Wilson Center Press, 2006). 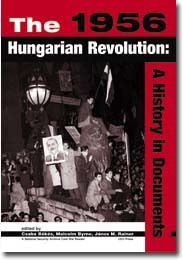 The extracts come from a two-volume history of CIA operations in Hungary (dated May 1972 and only 2 copies made) and from a two-volume history titled "The Hungarian Revolution and Planning for the Future" (dated January 1958). Because of the extensive security deletions, it is impossible to determine the length of each document, but judging by the page numbers, the first pair of volumes totals at least 99 and 71 pages, and the second at least 106 pages. 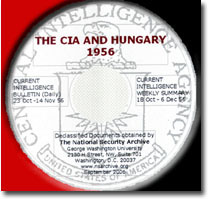 The CIA histories show that the Agency had essentially only one Hungarian-speaking officer based in Hungary during the 1950-1957 period, and for several years that person spent "95 percent" of his time on "cover duties." "He mailed letters, purchased stamps and stationery ...," among other "support tasks," the history noted. At the time of the Revolution in fall 1956, he was preoccupied with official contacts and doing interviews with Hungarian visitors. The name of the sole CIA officer in Budapest in 1956, Geza Katona, is censored from the CIA histories but included in Professor Gati's book with Katona's permission. Katona is also the subject of an extensive oral history interview in the Summer 2006 issue of Hungarian Quarterly (pp. 109-131), which repeats his cover story as a State Department official. According to the CIA histories, Katona took part in no operational activities because he had no time and was "constrained from so doing by the US policy of nonintervention." In fact, the histories say, "At no time in the period 23 October - 4 November, if one looks at the situation realistically, did we have anything that could or should have been mistaken for an intelligence operation." The CIA documents admit that the bulk of the reports CIA received were from the border areas near Austria. The Agency had no steady information from Budapest ("the storm center") or on a country-wide basis. The histories acknowledge this meant intelligence was "one-sided" and that therefore planning based on that intelligence was also "one-sided." On the issue of whether support from outside the country would have been useful or welcome (which may seem an obvious point, but until now the evidence has consisted only of memoir accounts and second-hand literature citing unnamed intelligence sources), the CIA histories reflect this lingering controversy, reporting with some feeling that, based on "the whole picture we now have of the mentality of the revolutionaries ... almost anyone from the West, of whatever nationality, color or purpose would have been received with open arms by any of the revolutionary councils in the cities of Hungary during the period in question." Two related issues have remained open to debate since the revolution--whether the United States sent weapons or ammunition to the rebels or deployed specially trained émigré forces into Hungary. The CIA records appear to put both questions to rest. A few days after the revolt broke out, Katona queried the agency on official policy regarding arms and ammunition. On October 28, Headquarters responded, "we must restrict ourselves to information collection only [and] not get involved in anything that would reveal U.S. interest or give cause to claim intervention." The next day, Washington replied more specifically "that it was not permitted to send U.S. weapons in." In fact, the implication in the histories is that transferring arms was never seriously contemplated: "At this date no one had checked precisely on the exact location and nature of U.S. or other weapons available to CIA. This was done finally in early December" of 1956. The histories contain other interesting insights into CIA operations, including the complaint that another obstacle to their activities was the involvement of the U.S. military (presaging current conflicts between the two bureaucracies in Iraq). The authors sarcastically write that "If we [the CIA] were in no position to act efficiently ... the military is, was, and always will be even worse off." They recommend that in the future the CIA keep the military "at arm's length" and only do what's necessary "to keep them happy." Of course, according to Soviet documents previously published by the National Security Archive (click here for more selections from The 1956 Hungarian Revolution: A History in Documents, edited by Csaba Bekes, Malcolm Byrne, and Janos M. Rainer, from Central European University Press), the availability of an abundance of intelligence assets does not necessarily provide all the answers. Moscow was also taken by surprise by the Revolution despite the thousands of Soviet soldiers, KGB officers, and Party informants present in Hungary. Rather than understanding the sources of the discontent, it was easier for Soviet operatives and even the leadership to cast woefully misdirected blame on the CIA for the unrest. Klement Voroshilov remarked at the October 28 Presidium session: "The American Secret Services are more active in Hungary than Comrades Suslov and Mikoyan are," referring to the two Party leaders sent to Budapest to negotiate a modus vivendi with the new Nagy government. At that moment, of course, the Soviet Presidium had more active members (2) in Budapest than the CIA had case officers (1).